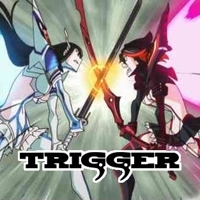 Trigger Inc., typically stylized as TRIGGER and also known as Studio Trigger, is a Japanese animation studio founded by former Gainax employees Hiroyuki Imaishi and Masahiko Ohtsuka in August 2011. You may know TRIGGER from their work in creating Little Witch Academia, or the anime series Kill la Kill, which aired from October 2013 to March 2014. In July 2013 Trigger launched a Kickstarter project in order to fund a second episode of Little Witch Academia, which achieved its goal of $150,000 in under five hours, and went on to raise a total of $625,518. Other shows TRIGGER has been involved in include Inferno Cop, When Supernatural Battles Became Commonplace, Ninja Slayer From Animation, Kiznaiver, Project X Zone, and Black Dynamite, among others.